Traditionally, when students study the trombone there is often an assumption that they will also learn how to teach the instrument along the way. This limits students to teach how they themselves were taught, for better or for worse. While there are a plethora of method books to help trombonists navigate how to play the instrument, there is a shortage of materials that focus on how to actually teach trombone. 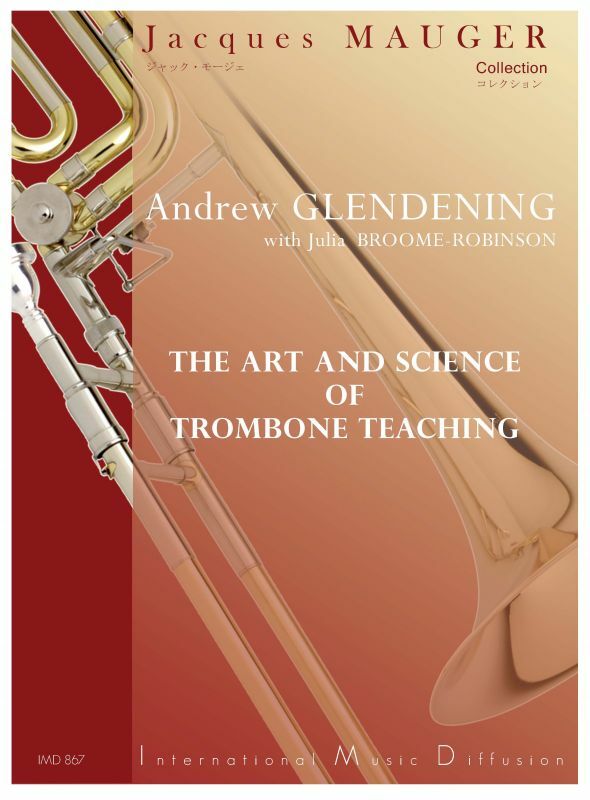 The Art and Science of Trombone Teaching is a new type of resource for trombone teachers, written from both the viewpoint of the teacher, Andrew Glendening, and the student, Julia Broome-Robinson. The Art and Science of Trombone Teaching is broken down into five sections, each addressing different elements of trombone pedagogy. These sections include discussion on the psychology, physiology, and physics of the trombone, as well as exercises and strategies to apply that knowledge to effective teaching. Throughout the book, there are diagrams, musical examples, suggestions for further reading and listening, and examples from Broome-Robinson’s experience from the perspective of the student working on a specific facet of trombone playing. “Part One: How We Learn” begins with a concise summary of how we learn, citing The Inner Game of Music idea of separating Self One, the conscious part of the brain, and Self Two, the unconscious part of the brain. A large portion of Part One is dedicated to a powerful tool which Dr. Glendening refers to as “strangeness.” Strangeness is “Creating a situation where the new concept feels strange and different [which] allow[s] the student to be free to experiment with different approaches. This can lead to specific practice tools that are individualized for the student’s particular situation.” Dr. Glendening goes on to provide numerous examples of ways to create strangeness, including wind patterning on your hand to use your sense of touch, and blowing on a pinwheel to help visualize the air stream. This section concludes with an in-depth discussion on the physiology and physics related to trombone playing, and includes visual aids, charts, and YouTube links to demonstration videos. “Part Two: Yin and Yang – Finding the Center” discusses finding pitch centers, allowing optimal resonance through target practice. A number of exercises utilizing breath attacks and glissandi are included as well as an actual target to aid the student/teacher in visualizing how to find the tonal center. Also addressed in Part Two are slide technique, air quality vs. quantity, and air matching studies. “Part Three: Tools of the Trade, or Actually Getting it Done” is a particularly useful section in Glendening’s book. It includes a number of teaching scenarios where a specific element of trombone playing must be addressed. Scenarios include double attack, puffing the cheeks, posture, tuning with piano, low and high registers, legato, as well as many others. Each element is addressed in one page or less, making it useful as a quick reference guide for the teacher. Part Three concludes with a discussion of warm ups and includes musical examples from the routines of Bill Adams, Eric Klay, Thomas Cramer, and Dr. Glendening. “Part Four: Ruminations” includes thoughts on a number of other aspects relating to trombone playing. Topics include respecting your elders, doctorates and college positions, learning from non-trombone methodologies, and elements of musicianship. “Part Five: Exercises” consists of a twenty-four page compilation of musical exercises focused on advanced flexibility, articulation, and scales. The Art and Science of Trombone Teaching is a unique tool for any aspiring or current trombone teacher. The content of the book is balanced between in-depth discussion on the mechanics of playing the trombone and Glendening’s thoughts on musicianship. Additionally, Broome-Robinson includes anecdotes from the student’s perspective, demonstrating how Glendening’s ideas are applied. The book is incredibly well written and easy to understand with plenty of insight and examples. The Art and Science of Trombone Teaching will serve as an excellent textbook in graduate-level trombone pedagogy courses.